Jesus is always faithful and His love endures forever! These are messages that were laid on my heart. I pray that they will be a blessing to you and that through them you will experience the voice of God guiding your life. Where Were You On Sunday Morning? What does going to church mean? The bible talks about miracles among His people. Where are they? If we love one another is that enough? Joy? What Happened to That? Could That Be An Angel In Front Of You? As Blake stared at the empty side of his bed, he knew that his wife must be in Heaven. If anybody was ever going to Heaven, it would be his precious Elaine. Although he wanted nothing more than to join her there, he had to wonder if he had the faith to make it into Heaven. Her faith had been incredible. In comparison, his faith seemed so empty, almost fake. Journey with Blake as he seeks to restore his life and repair his faith. Burst Into Flames: A Parable is an encouraging and challenging story of Christ's power in the life that is surrendered to Him. 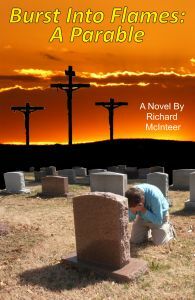 Available as a free e-book with formats for Apple, Kindle, computer or phone. Available in print at publisher's cost.